When we brand a landscape, are we just turning it into a commodity or are we building a sense of place? According to a recent article in Forbes, brand is a term that is “widely used but unevenly understood.” Agreed. Brand expert Marty Neumeier, author of The Brand Gap, describes brand as a gut feeling. It is the emotional connection they—the public—have when traversing a street or trail, that we—landscape architects and experiential graphic designers—have a role in building. When done well, landscape architecture and branding both strengthen emotional connections to place. Experiential Graphic Design is located at the intersection of landscape architecture, architecture, urban planning and communication design. According to the SEGD (the Society for Experiential Graphic Design), the industry “create[s] content-rich, emotionally compelling, experiential spaces for a wide range of environments” to fuel a dialogue between users and the spaces they inhabit. Experiential graphic designers orchestrate familiar elements of design—typography, color, imagery, form, light and sound—to communicate themes and narratives by means of fixtures in the environment, including signage, panels and objects. Like LAs, we consider how and when information is delivered to evoke emotional connections. As practitioners, our work is made more challenging when the landscape is considered special because of its historic or cultural significance. In these heritage landscapes, integrity and authenticity are key to our understanding of time. Located at key corners and junctions throughout the town, the signs share historical information and directions to historical buildings of note and the area’s main attractions. The same question challenges so many heritage towns: how do you add anything to your community—like buildings and signage—that respects the past while being relevant to the present? Old Town Lunenburg, for example, is one of the few spots in Canada used for 19th and 20th century period films because it lacks many artifacts of the present-day. Time, however, has taken a toll, perhaps irreversibly on the offshore Atlantic fishery. As traditional industries vanish and society adapts to socio-economic change, communities like Lunenburg must—by virtue their UNESCO designation—carefully protect the fragility of their historic fabric. When experiential graphic design firm Form:Media began to work with Lunenburg to develop a place brand, it was well understood by the town that we should use period fixtures and design wooden signs with rope and wrought iron, in keeping with the tradition of boat building, regional design vernacular and the fishery. That said, the sincerest form of flattery may NOT be imitation. Today, material and craft differ vastly from that of over a century ago. When the work is not truthful—fake old—the lack of authenticity impedes the visitors ability to understand the value of the artifact—the town. Signage is a modern necessity for most communities. Taking time for contemplation, the Town chose instead to respect the integrity of the UN designation by implementing signage which would contrast with the town’s historic background, not mimic it. The design team purposefully choose modern typefaces suggestive of eras past, and a colour palette that would not detract from the town’s brightly coloured houses. The sign’s slender vertical design fits within a very narrow pedestrian corridor: visible when required, inconspicuous when not. From visitor’s perspective, the signage directs and informs. The signage, however, should support the notion of authenticity by not undermining the heritage landscape. Our goal for cultural heritage landscapes is to promote and to interpret. A unique challenge: to create an efficient bilingual word mark. A star replaces the hyphen used only in French, while also symbolizing the significant Acadian heritage of Grand Pré. The logo pays homage to Glooscap and the high bluffs of Blomidon, the 17th century Acadian dyke system, current day farming practice, and the Acadian memorial. The Landscape of Grand Pré is a living artifact: an historic polder landscape; a preserved community-based land management system; a heritage landscape inhabited by Mi’kmaq people and European settlers; and a cultural landscape that serves to commemorate the Acadian diaspora. If brand is about evoking emotional connections through design, then this program overtly interprets the cultural landscape to enhance understanding, even elicit feelings of empathy. Whereas the landscape of Old Town Lunenburg is a protected urban fabric, the Landscape of Grand Pré bears testimony to those who formed, harvested and lost, and continue to work this artificial hydrological entity. The 1,300 hectare site now has a unified signage program to welcome guests to the land, to direct them to points of interest, and to interpret the environment. Because integrity was key, the work required a light footprint on a landscape already dramatically shaped by human activity, however imperceptible those past interventions were to the modern eye. History and reflection are of great importance to the community. A painterly brandmark features the Acadian memorial church, the dykelands, agricultural silos, and Cape Blomidon aims to form an emotional connection with the landscape. Interpretive signage improves the visitor experience by encouraging understanding of Landscape of Grand Pré, while directional signage provides clear directions to destinations that are important to residents and visitors. Together, these build an emotional attachment for those that experience it. In Red Bay, the brand and the built environment are inextricably linked. 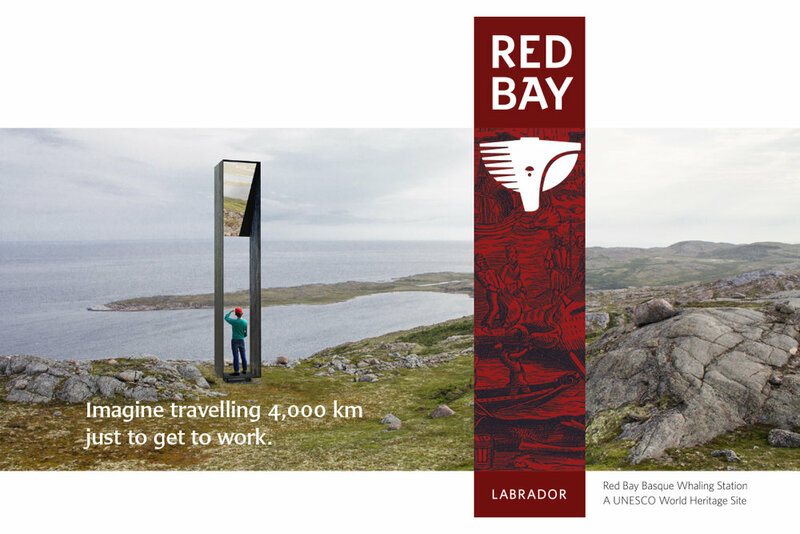 In this system, a single metaphor (the “portal”) and a unifying set of proportions guides the form of everything, including the Red Bay logo, the shape of the monument, and the form of all signs in the system. Integrity—according to the United Nations World Heritage program—is a measure of the wholeness and intactness of cultural heritage and its attributes. Red Bay, Labrador is recognized as the most extensive and best preserved example of proto-industrial processing of large-scale production of whale oil rendering, anywhere. The site once bustled with 16th century activity centred on whaling, holding rendering ovens, cooperages, wharves, and temporary living quarters. Today, little historic evidence remains on the landscape, aside from an interpretive centre. Strictly through the lens of brand, there was a disconnect between what visitors expected—the promise of a 16th century Basque whaling station—and the current town of Red Bay, mostly built in the mid-20th century. Visitors to Red Bay Basque Whaling Station (BWS) will largely experience the latter, while interpreting the former. For the town of Red Bay, Form:Media’s place-branding focussed on enhancing the destination, and revealing an unperceivable history of place. Essentially, the work advocates for the visitor by addressing another aspect of brand and the built environment: aligning the promise with the experience. Honesty is therefore paramount. We had to be cautious about how to represent Red Bay Basque Whaling Station. From a purely graphic perspective, the use of a modified 16th century woodcut, paired with photographs of the current Red Bay landscape promises an experience which can actually be delivered: indoor interpretation of Basque whaling heritage with rugged outdoor experience. The designers’ consideration of the landscape was deliberate, fuelled by the promise of a contemporary experience. Central to the wayfinding system are the monuments, which relate to observation posts used by Basque sailors to spot whales coming through the Strait of Belle Isle. These monuments of blackened steel evoke plumes of dark smoke which would have wafted from the tryworks where whale blubber was rendered into lamp oil. The monument design is a work of signature architecture, and as important as other aspects (assets) of the brand (its logo, typeface, symbols, colour scheme). The structures are meant to be prominently shown in photographs, yet are best seen in person. Texture and colour echo the dark oily skin of the right and bowhead whales. Their mirrored top is a contemporary reflection on the Basque sailors’ use of fire to signal whale pod sightings. For Red Bay, integrity was again the paramount criteria. The landscape, relatively unaltered for recent centuries should remain so. Situated sparingly within the natural environment, the monuments are meant as contemplative spaces for the visitor, to elicit notions of time in the present-day, and that of five centuries ago. We describe them as portals, a notional view to the past. The monuments frame points of view, both towards an ocean once circumnavigated by the Basque sailors and back to a community continuing to operate as an outpost. When designers brand a landscape, we are aiming to influence people’s perceptions. The cultural heritage landscapes of UNESCO World Heritage sites are fragile environments, and we recognize that in these places, we can help shape society’s understanding of the passage of time. When visitors connect emotionally with these places, then we know we have NOT commodified space, but rather built a stronger place-brand that can help preserve these landscapes for future generations. Landscape/Paysages Journal is a bilingual Quarterly publication of the Canadian Society of Landscape Architects. Landscapes/Paysages is the professional journal of landscape architecture in Canada. It presents a Canadian perspective on professional practice and provides a forum to discuss and debate matters related to design, culture and environment, as reflected in our landscapes.